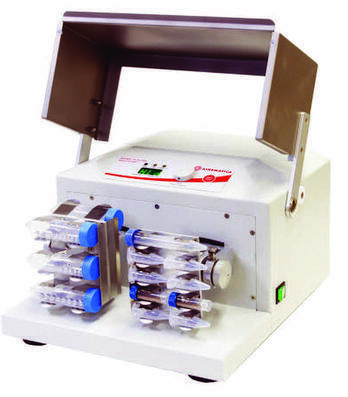 Developed for scientists, who need efficient disruption of small amounts of sample. It uses a powerful DC brushless maintenance free motor, and is controlled by a digital processor. 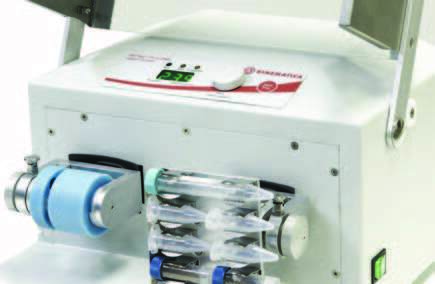 With a programmable frequency from 1 to 30 Hz and a timer from 5 seconds to 60 minutes the POLYMIX PX-IG 2000 can quickly and efficiently disintegrate and or homogenize samples. The POLYMIX® PX-IG2000 is a laboratory machine, which is suitable for milling and homogenizing soft, fibrous, hard and brittle materials in the dry and wet state. 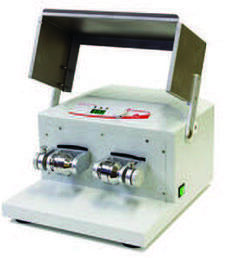 It is used for fast, super fine milling of 2 samples simultaneously. The closed milling system guarantees complete recovery of the samples. Due to the extremely short milling time and the high final fineness of the milled material, the POLYMIX® PX-IG2000 is also ideally suitable for sample preparation for all spectral analyses. Final fineness of down to 1μm can be achieved, depending on the milling time and the specific properties of the sample material. The optimum milling cup filling is as a rule 1/3 of the milling cup volume. See digital imaging equipment for particles size and shape analysis to 400 nm. Exceptions to this are voluminous materials, such as wool, leaves, and grasses. In these cases a filling level of 70-80% is necessary. (power switch shines) or OFF the power of the machine. - RUN signal light (green) - shines when POLYMIX® PX-IG2000 is running. - TIME signal light (yellow) - shines when POLYMIX® PX-IG2000 is set on time. between TIME and FREQUENCY setting values. If you rotate ENCODER knob fast, then values on display go up or down quickly. - START/STOP key - starts or stops the operation of POLYMIX® PX-IG2000.